43246 Brownstone Court | Terrific Tudor! 43246 Brownstone Court has SOLD! Sorry you missed it! 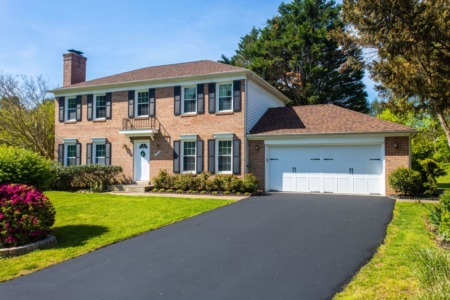 Click here to view other homes for sale in Ashburn Farm. 43246 Brownstone Court in Ashburn, Virginia boasts 5 bedrooms, 4 full baths, 3 finished levels, and amazing outdoor space to enjoy the warm seasons in Virginia. Highlights of this gorgeous home include 2-story entryway, hardwood floors, gourmet kitchen and amazing backyard with mature landscaping. Formal living room with crown molding and neutral features opens to the dining room where holiday dinners create great memories. Butler’s pantry with wine bar connects the dining room to the kitchen for easy entertaining. This home’s main course is the gourmet kitchen featuring granite countertops, glass front cabinets, center island, updated appliances and plenty of room for a large breakfast table. Step inside the large pantry with shelving galore. Look out from the kitchen into the cozy family room with gas fireplace, recessed lighting and built-ins. The master bedroom welcomes you with a sitting area, angled ceiling, a private spa-like bath and two walk-in closets. The upper level has 3 additional bedrooms and 2 full bathrooms. All the rooms have great closet space and windows to let the light in. The walkout lower level has room for living, entertaining and storage with hardwood floors throughout. The 5th bedroom with adjoining bathroom makes this a great space for guests who are in town. Sliding glass door takes you out to patio and wooded backyard. Weekends are made for relaxing on the multi-level deck with screened-in gazebo. Enjoy the sounds of the waterfall going into the small pond. Surrounded by mature trees this backyard is private and perfect for spring time barbecues. 43246 Brownstone Ct is located in the Cedar Lane Elementary, Trailside Middle, and Stone Bridge High School districts of Loudoun County. Ashburn Farm offers a variety of amenities including 3 outdoor pools. 12 tennis courts, 19 playground, a clubhouse, 28 miles of paths, 8 basketball courts, 5 ponds with fish, and a baseball field. Conveniently located near retail including a grocery store, restaurants, and salons. Neighborhood favorites include Painting with a Twist, Thai Deelish, and Zinga.